Star Wars was the greatest movie I saw as a kid. It put realism into Science Fiction for me with its dusty, weather-beaten, characters and vehicles. As soon as I stumbled across the Action Fleet range of 20mm figures and vehicles I knew I had to build ALL the Star Wars armies....and even make up a few new ones along the way. 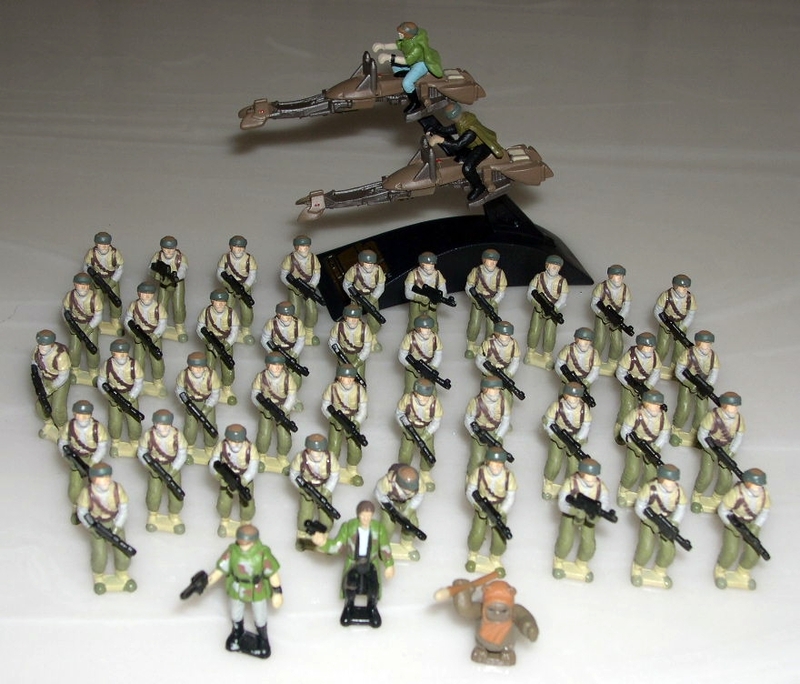 I have used Micro machines for some projects (Gungans, and Jawas vs Sand People), and overall that would have been a much easier and cheaper proposition (with 8 or 9 figures per pack), but for some reason the Action Fleet figures appealed to me. Assembling armies is an expensive proposition though, as each figure tends to come one at a time with a vehicle or in a Battle Pack. Thank goodness for bulk lots on eBay, and friends like Joe Lynch and John McManis. 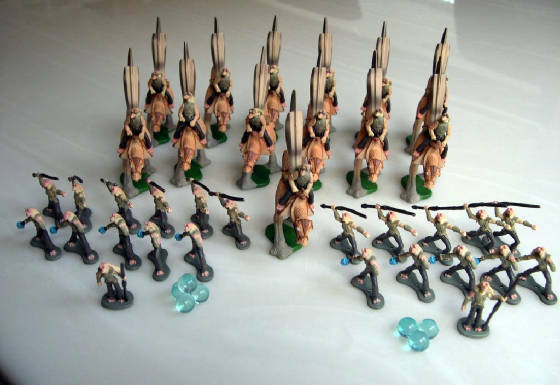 This army comprises about 80 Gungan infantry (in 4 warbands), 12 Gungan cavalry on Kaadus, 6 catapults firing energy balls, and 3 Fambaas carrying the large energy shield defence system. The Gungans will generally be allied with Naboo forces and Jedi elements. The infantry are Micro machines and the remainder Action Fleet. Catapults and Fambaas are back in NZ so here are some pics of the infantry and cavalry. 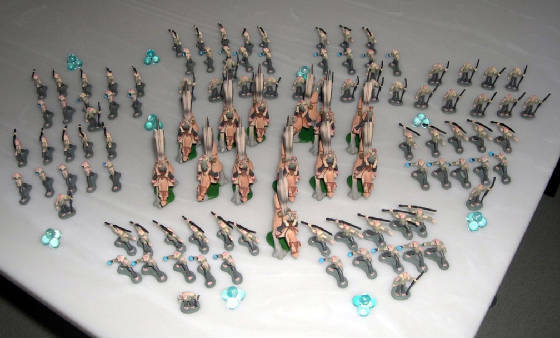 This army comprises 40 Naboo figures. 20 Paramilitary/Police types and 20 Civil Guard types. 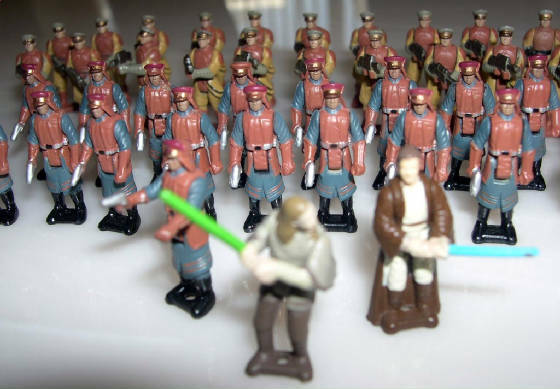 They will usually be allied to the larger Gungan forces, however I'll shortly double this force in size so that it can fight alone against the Trade Federation Armies......or maybe even against the Gungans. Will generally be a Jedi element aligned to this force as well. Not much in the way of support weapons for these guys....but will probably add a Gian Speeder. All figures are Action Fleet. 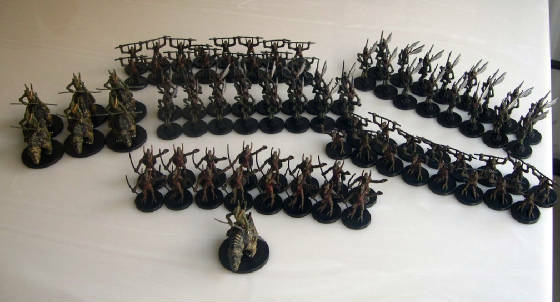 This army comprises 9 Geonosians mounted on Orrays and 6 units of 16 Geonosian warriors (mix of soldier, drone, and overseer figures). Will generally be supported by Trade Federation Droid allies. All figures are WOTC Clone Strike figures which, strictly speaking, are too large for the Action Fleet figures which make up the rest of my Armies. But for such a unique set of figures I'll make an exception and claim that these are a breed of Giant Geonosians. This army comprises 40 Gamorrean warriors to either fight in defence of their homeworld/system, or as a Mercenary unit hired out to a Crime Cartel (such at the Hutt's) or the Imperials. Also known as the "Big Pig" or the "Shrek" Brigade. All figures are Action Fleet. One of these days I'll add a rifle to their backs to give them firepower. 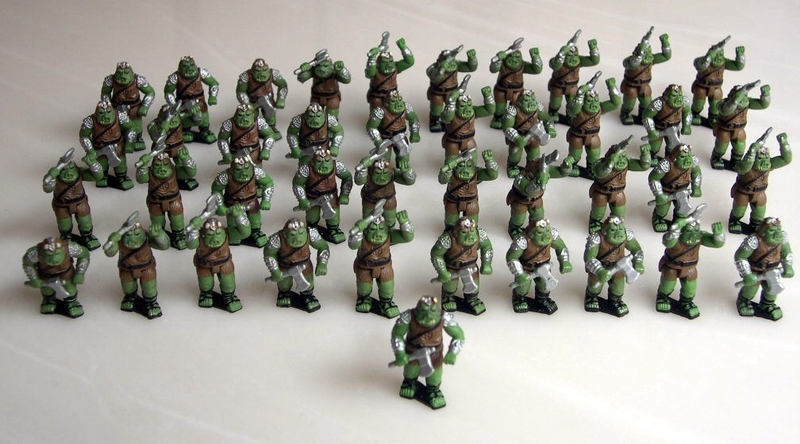 This army comprises 30 Rodian warriors to either fight in defence of their homeworld/system, or as a Mercenary unit hired out to a Crime Cartel (such at the Hutt's) or the Imperials. 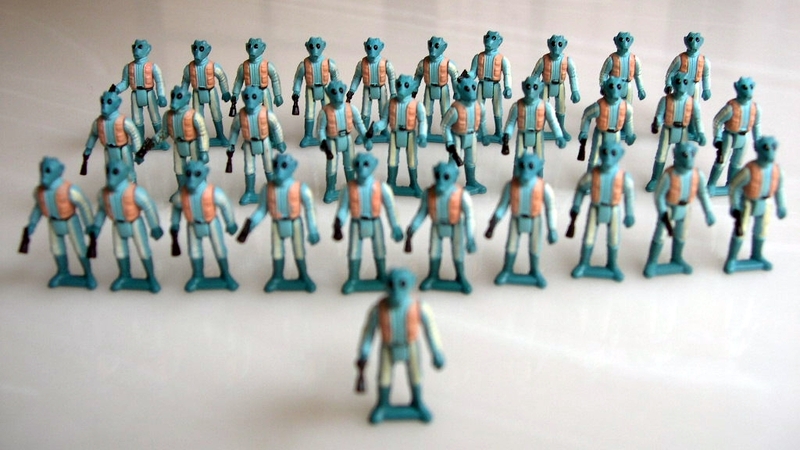 All figures are the Action Fleet Greedo figure. 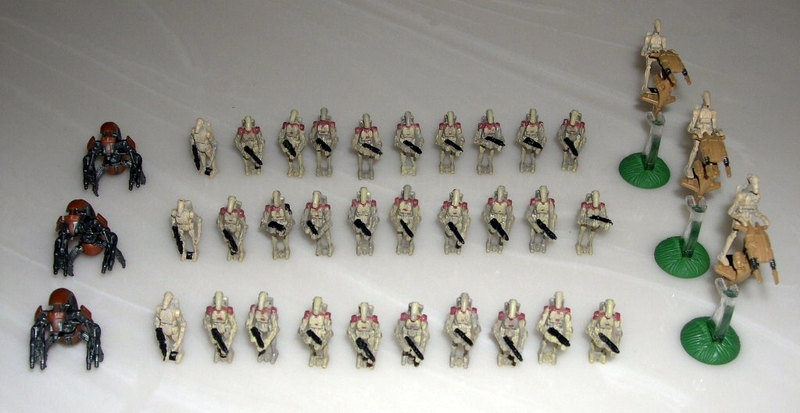 This army comprises 30 Trandoshan warriors to either fight in defence of their homeworld/system, or as a mercenary unit hired out to a Crime Cartel (such at the Hutt's) or the Imperials. 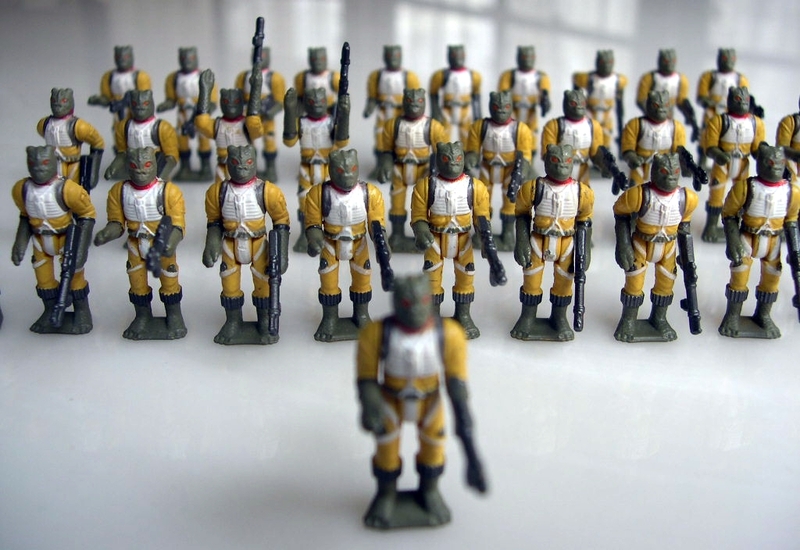 All figures are the Action Fleet Bossk figure. 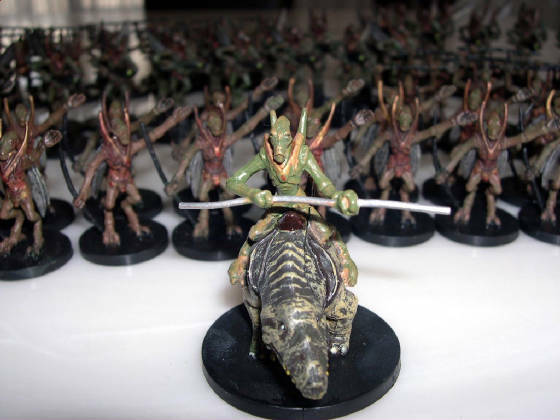 My friend Terence Corrigan converted 3 of these guys to ride the Dewback Dragons usually used by the Imperials (safely stored back in NZ so no pic at present). 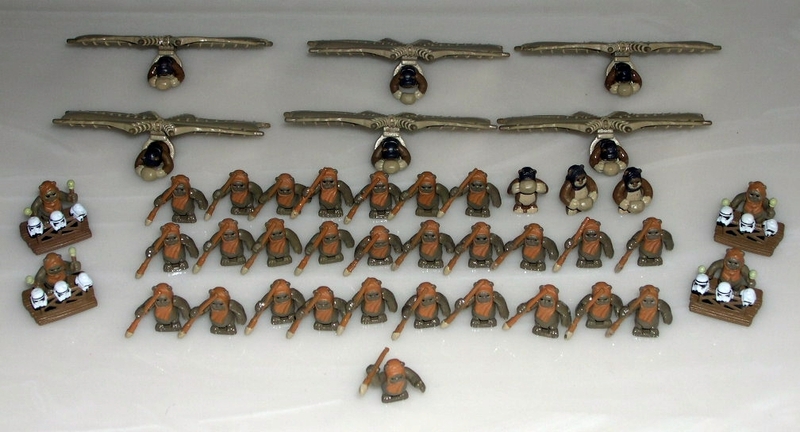 This army comprises 30 Ewok infantry and 6 Aerial Flyers. 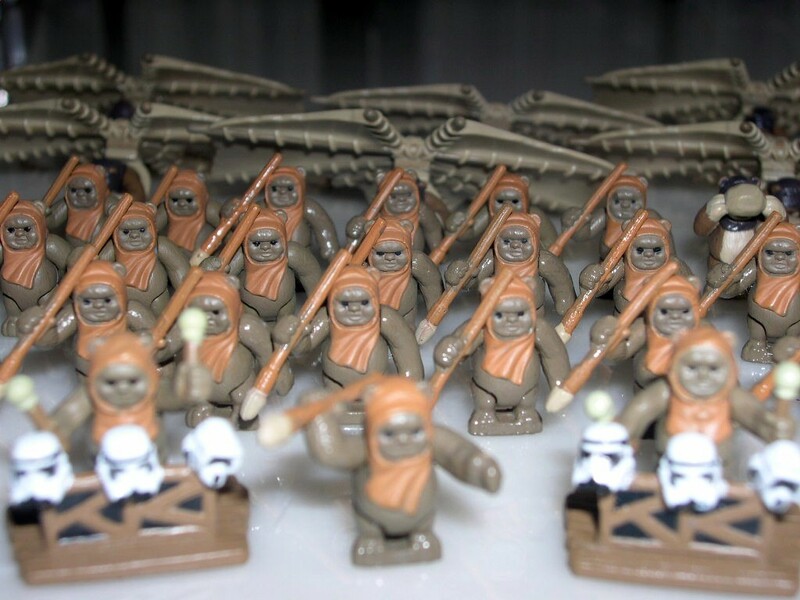 The Ewoks will generally be allied in battle with Rebel forces and Jedi elements. The infantry and gliders are all Action Fleet. 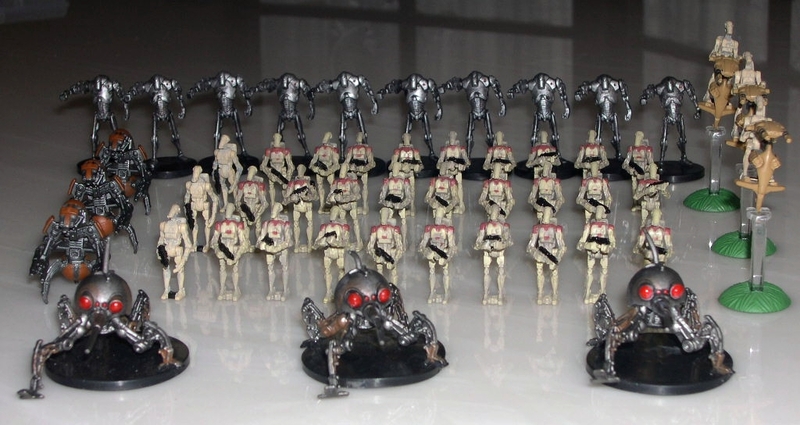 This army comprises 90 Battle Droids, 9 Droids on STAPs, and 9 Destroyer Droids. The Army comprises 3 divisions and only one is shown below (simply because the Droids are a nightmare to stand up when not properly based!!). All figures are from Action Fleet sets. The army is supported by 3 x AAT Tanks and is delivered to battle in 3 x MTT Transports. The AFVs are not pictured as they are all back in NZ. 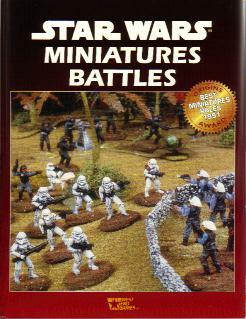 As above, except 30 Super Battle Droids and 9 Dwarf Spider Droids have been added to boost firepower. Both of these figures are from the WOTC Clone Strike series. 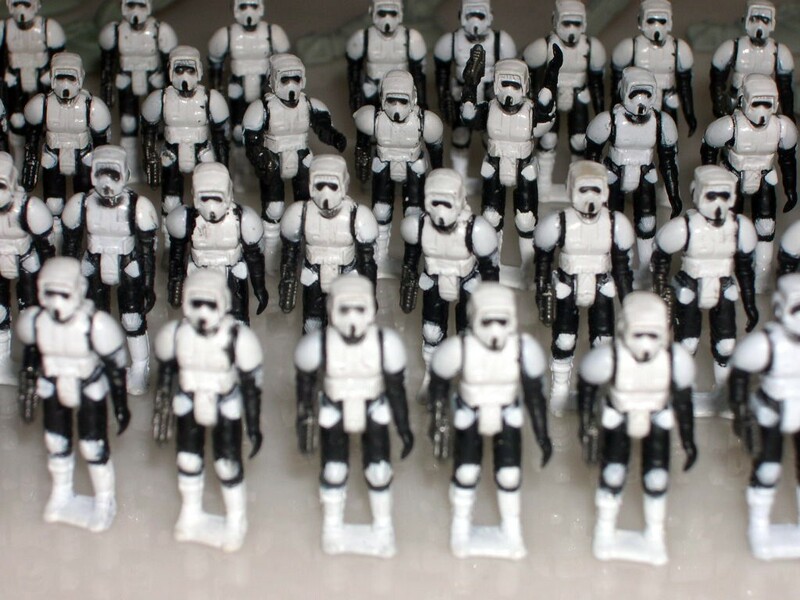 (Once again, only one divison of the Droid Army shown). Apparently, statistics from the Geonosis battle indicate Republic forces faced upwards of 1,000,000 battle droids and 100,000 super battle droids, as well as 15,000 dwarf spider and 3,000 destroyer droids. 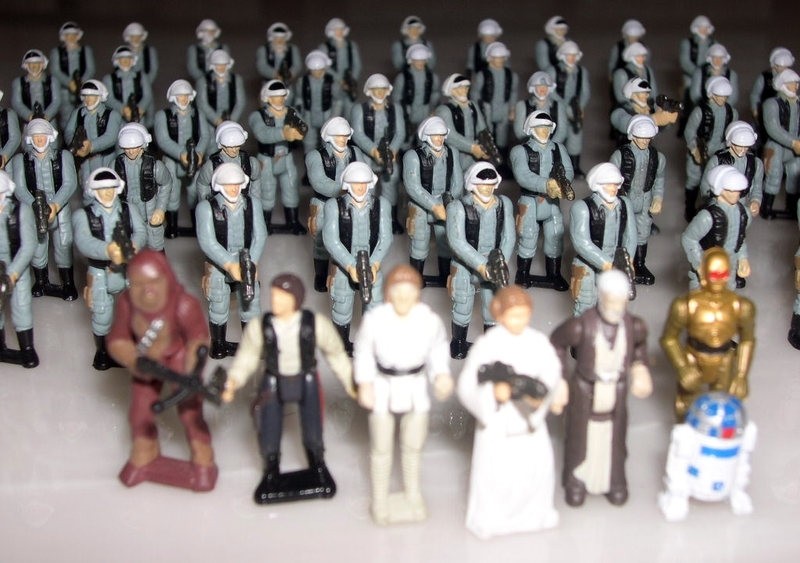 Army #10 Rebel Commando Force (Endor Campaign)This army comprises 40 Elite Rebel Commandos with some speeder bikes (just two shown: Luke and Leia of course). For the Endor Campaign, this force would fight in conjunction with Ewok allies. All figures are from Action Fleet. 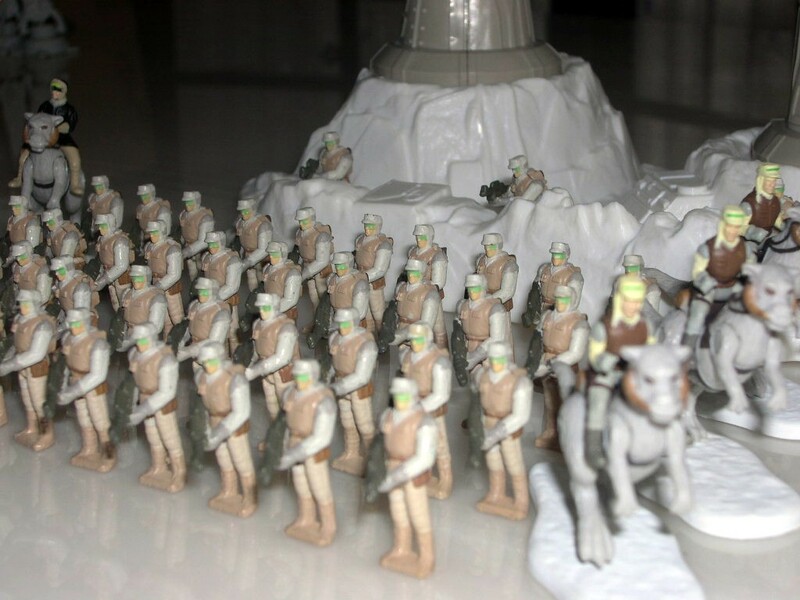 This army comprises just over 40 infantry, a dozen Tauntaun mounted cavalry (only 6 shown below), and 3 snow speeders. Will generally operate in conjunction with a defensive emplacement to counter the Imperial hardware thrown at them. All figures are from Action Fleet. 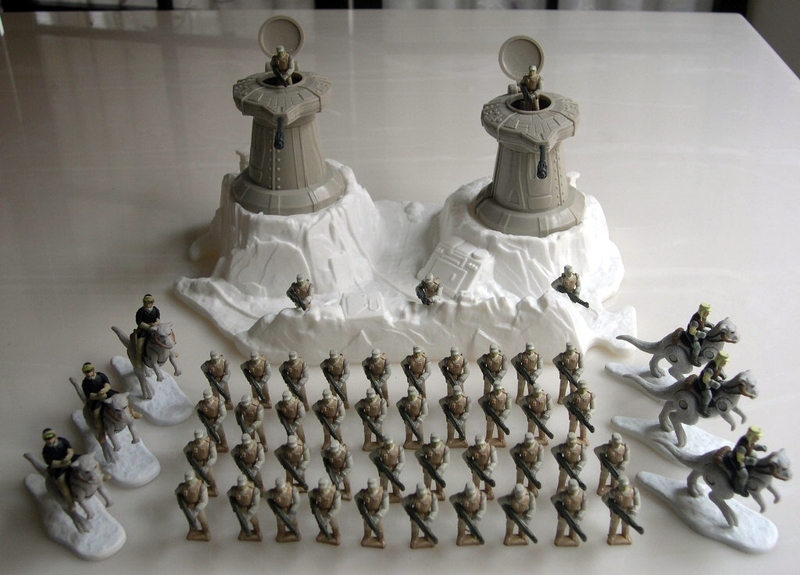 The Turret Defence system is from the Kenner Micro Collection Hoth series. The snow speeders (Action Fleet) are not pictured as they are all back in NZ. 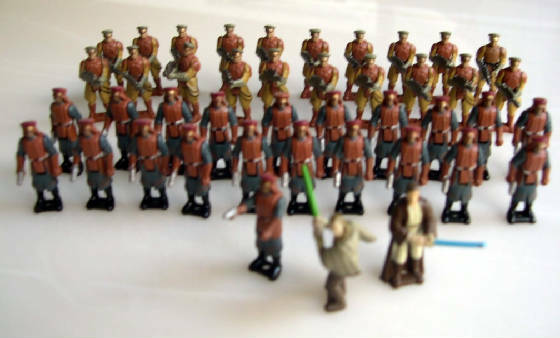 This army comprises 50 infantry, with associated Heroes and Jedi elements. All figures are from Action Fleet. 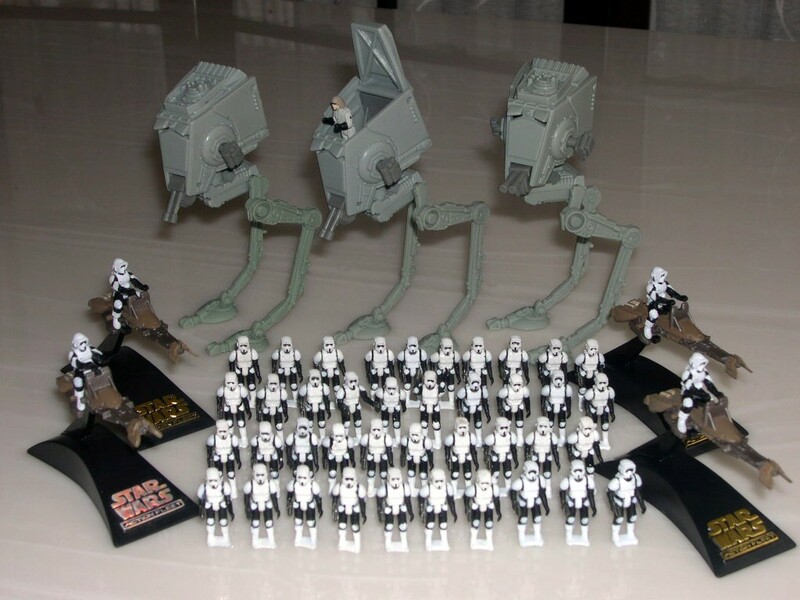 This army comprises 40 infantry, half a dozen Scout troops on speeder bikes (4 shown), and supported by as many AT-ST Scout Walkers as are required (3 shown). Will be backed up by Storm trooper divisions in case of attack by Rebels, or if commencing a major offensive on behalf of the Emperor. All figures and vehicles are from Action Fleet. 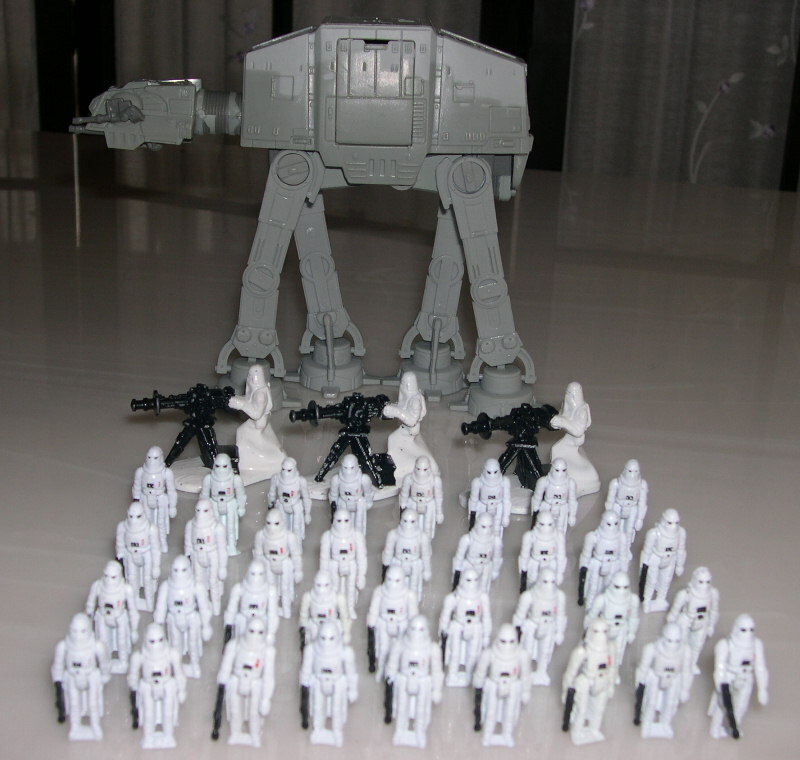 This army currently comprises 35 infantry (eventually 50), supported by heavy weapons, and as many of the massive AT-AT Walkers as are required (one shown). 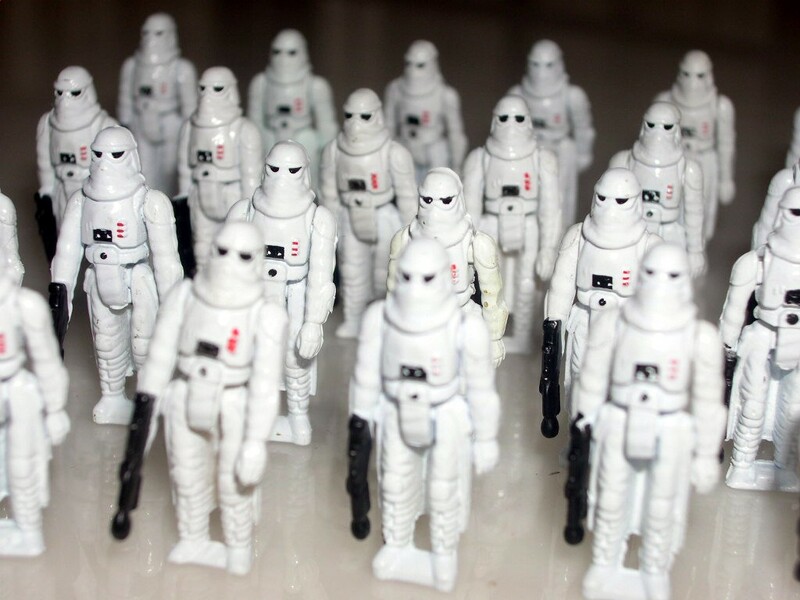 All figures and vehicles are from Action Fleet, except the heavy canon which are 25mm diecast Kenner figures. A little big, but by the time I properly base the Snow troopers should look OK. 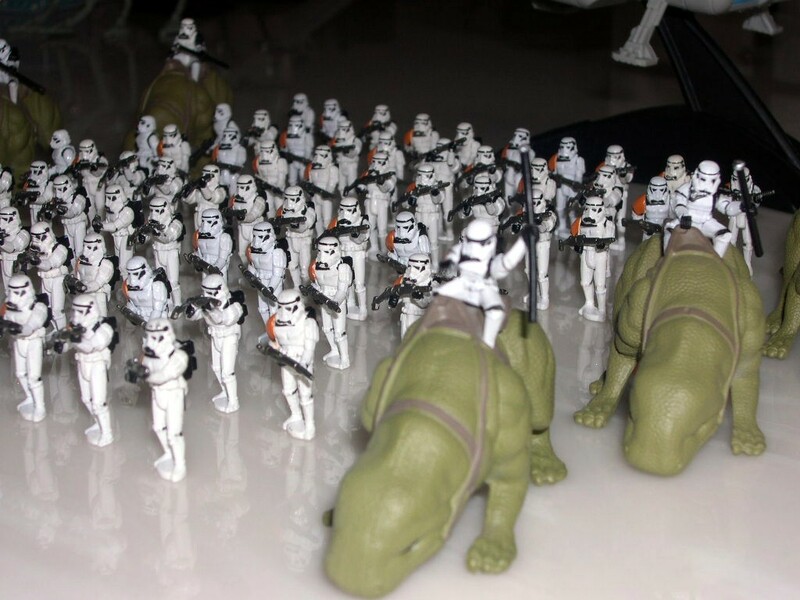 This army comprises 70 Stormtroopers together with an Imperial Landing Craft and 6 Dewbacks to provide some local transportation. In reality they will be supported by all the fiendish AFVs and weaponry at the Empires disposal, and with scout troopers and elite snow troopers at the ready to support them in any operation. All figures and vehicles shown are from Action Fleet. I have actually used the Sandtrooper figure as my Stormtrooper.....I like the colour scheme and the big meaty looking gun. Actual Stormtrooper figures are used for the squad leaders. This army will eventually comprise 60 Clone Troopers, supported by 3 x AT-TE Tanks, 3 x Gunships, and a unit of Jedi Knights. I already have the Action Fleet AT-TE's and Gunships (Pics of the Gunships and AT-TEs can be seen on the Wargames in Action page). 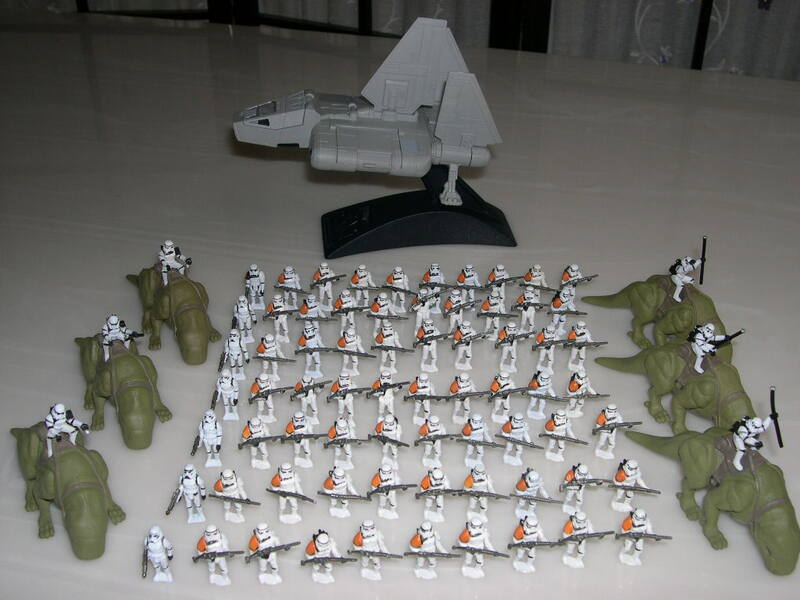 As for the Clone troopers.....well, there are none in Action Fleet scale. My intention is to convert and paint the Boba Fett figure. I'll repaint a few Action Fleet Lukes in different colour schemes and convert some other Aliens into Jedi for the Jedi unit.